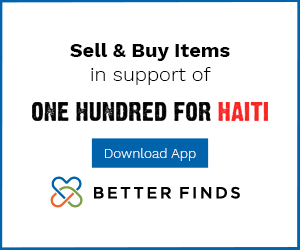 Huge success in Haiti on our recent trip! I am just back from fifteen days in Haiti and wanted to write a personal message to say thank you to all the donors who made the following things possible! If you missed any of our updates be sure to check the One Hundred For Haiti Facebook page to get caught up! – In the first week of the trip, we (Michael Scott, One Hundred For Haiti supporter from Seattle) and I joined a group from Peacework Medical who do incredible work in Haiti by putting in medical clinics in extremely rural areas. We helped Peacework members with their new clinic in Gard Hiram (a tiny village near Ranquitte, a small town in the northeast of Haiti). We leveled the floors with dirt so that they could be flattened and cemented, helped build benches for the clinic, painted the walls, and most importantly: we established our Moto Logistics Program in the town of Ranquitte and the village of Gard Hiram so that patients can have better access to the clinic. These motos will save patient lives, give jobs to drivers, and help both communities be more mobile. – We established a plan to save thousands of lives in the area around Ranquitte through our new Rural Water Project. Read more about it at the link and at the Rural Water Project link above. We are going to help save 12,000-15000 people from being exposed to cholera over the next few years with your help. – In Port au Prince, my long-time friend Dr. Jacques Denis took me to the Centre de Sante Saint Martin II medical clinic to show me the security door that One Hundred For Haiti paid to have build and installed, the result of the new cement work that we paid to have Haitian skilled workers hired to do (so people wouldn’t fear cracks in the walls anymore, thinking that another earthquake would bring the building down if they were being treated) and most importantly, showed me the new sinks that had been installed. The clinic had never had running water before your donations made it possible! Total win. – I met with our friends at the Kay Angel Orphanage in Jacmel and visited the children there. Many of the children of the orphanage have either been orphaned by AIDS or have HIV themselves, and I brought donated shoes for a few of the girls who needed them to wear to school, some yoga mats for a very physically challenged orphan there who needs them for comfort as he sits on the floor, and I talked to Gala (the new director) about the status and future of the orphanage as it transitions after the 2012 death of Lia van de Donk (former director and a dear personal friend). – In the village of La Source, I met with Chrismedonne Lajeunesse who showed me the accounting statements for their VERY successful Moto Logistics Program progress. They have two motos running currently and are extremely happy with them. I also brought extensive medicines from the USA so that the village can be better prepared in the case of illness. – I then drove five hours and met with Morgan Weinberg who is running an incredible program in Les Cayes in the southeast of Haiti. Morgan has involved herself directly with street youth there: former child slaves, abandoned kids, abused and neglected or worse. She has established a safe house there and One Hundred For Haiti will be providing barbed wire security for the entire grounds of the safe house to protect the children (and Morgan) as they live there. We will also be following up with last years successful Bikes for the Boys Program there (we bought each boy a bike to use and enjoy) by providing training for them to fix those bikes, thus learning a marketable skill in the process! – Sarah Rolfe (One Hundred For Haiti core team member) was able to procure donations of medical supplies in the Seattle area which I delivered to the Centre de Sante Kenscoff medical clinic. Dr. Marie Denis, director of the clinic (and wife of Dr. Jacques Denis) put the supplies to use literally immediately as I was standing there. I have comments from Dr. Denis on video and will edit them in the near future. Overall: it was an incredible trip. I am writing a detailed account of it now as I have had an offer to have that writing published! Stay tuned for details about that. 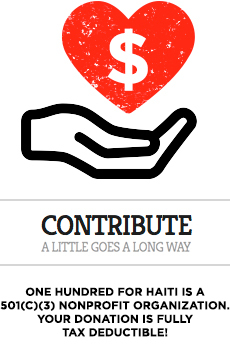 For now, consider spreading the world about One Hundred For Haiti. Monthly recurring donations, in any amount, help so very much. $10 per month from you and just four friends over one year buys us a water treatment tank for our Rural Water Project. Each tank costs $500-700 depending on how many families it serves. $1800 total provides a salary for a full time nurse FOR A YEAR at the medical clinic in Gard Hiram. We have ideas in mind for many projects, but it all starts with support. Thank you in advance for supporting the ongoing work that we will be doing!